If the TNPSC VAO Answer key pdf download links in the TNPSC Website are not working try in the Radian IAS Academy 's website , they have alternative links for TNPSC official answer key. TNPSC has conduced VAO Exam 2014 on 14-06-2014 (Saturday) for filling up the vacancies of 2342 Village Administrative Officers. After successfully writing the exam, there will be expectation of lakhs of candidates to see the TNPSC 's Official Answer Key for the VAO Exam 2014. 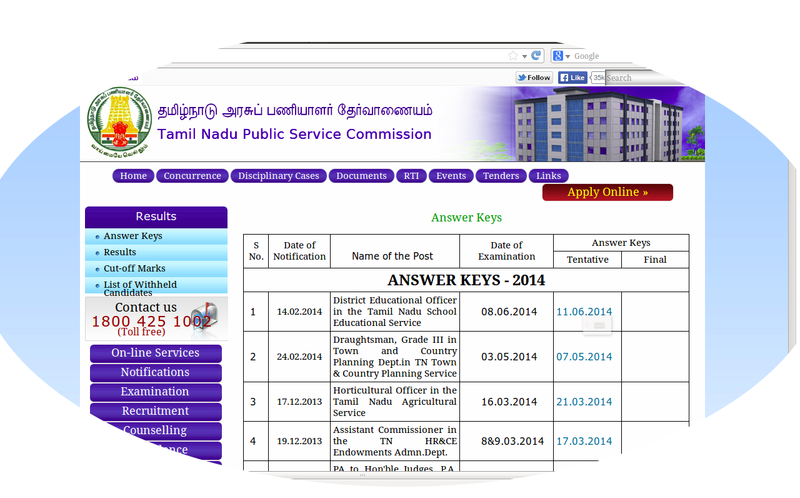 TNPSC usually publishes the answer keys after 3 to 7 days of the particular exam date. 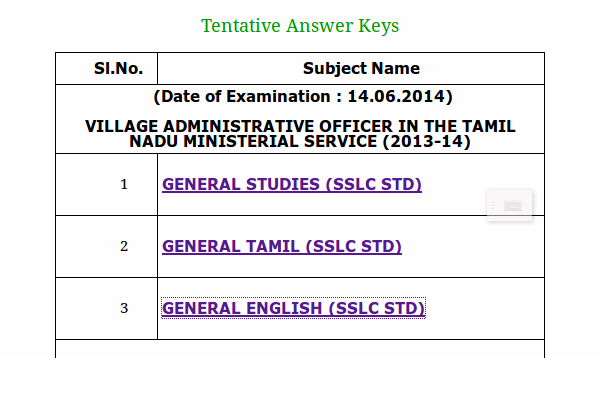 For example, it published TNPSC DEO Exam ( Exam date 08-06-2014) Answer Key 11-06-2014 (with in 3 days). So we can expect the answer key in the next week Monday or Tuesday. If you want to see the earlier TNPSC Exams and their Answer Key dates , just click on the following image. What is the Expected Cut Off Mark for TNPSC VAO Exam 2014 ? Many TNPSCPortal visitors have asked for the TNPSC VAO Exam Cut off Marks. The real cut off marks of TNPSC VAO exam can not be assessed till the result date. But we can assume the cut off more are less accurately. TNPSC Portal is studying the VAO question paper. Since, TNPSC yet to publish the official answer keys for TNPSC VAO Exam 2014, after the announcement of official answer key by TNPSC, we will have an exclusive feedback from our visitors and will post expected cut off marks soon.